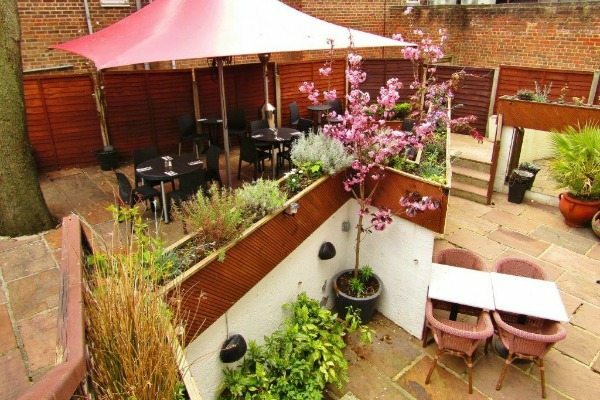 Over the course of the last year the fabulous Old Bank restaurant has become one of our firm favourites. Sitting in Kemp Town, near the sea front, in a lovingly converted old-fashioned bank, this fantastic cheery restaurant unashamedly caters to dedicated devourers of meat. 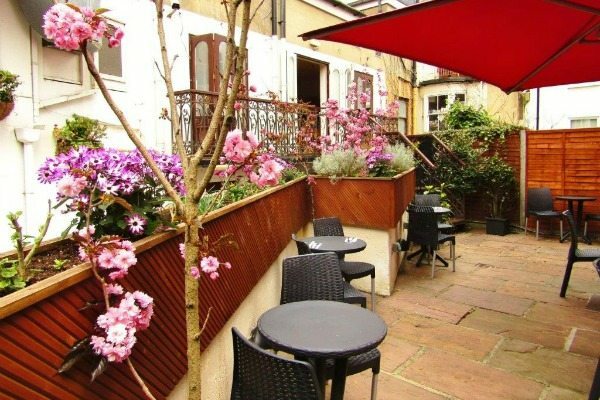 We had already enjoyed several stunning evening meals there but hadn’t as yet had the opportunity to enjoy lunch in their lovely courtyard. But, finally, spring had sprung and here at last was our chance, happy days! The staff, as ever, were welcoming, friendly and very helpful without being intrusive. We were shown through the French doors and down the wrought iron staircase into the spacious, pretty, Indian sandstone-paved courtyard. There were gorgeous free-standing cherry trees in spectacular full bloom and chest high planters loaded with a variety of herbs and yet more pretty blossoms. We were struck by how peaceful it was despite being only a stone’s throw from the hustle and bustle of the city’s heart. You can either sit at a table in the full sun or under a lovely big shady umbrella. We did both during the course of our meal, just to be awkward, but Alex our lovely waiter was ever-accommodating. 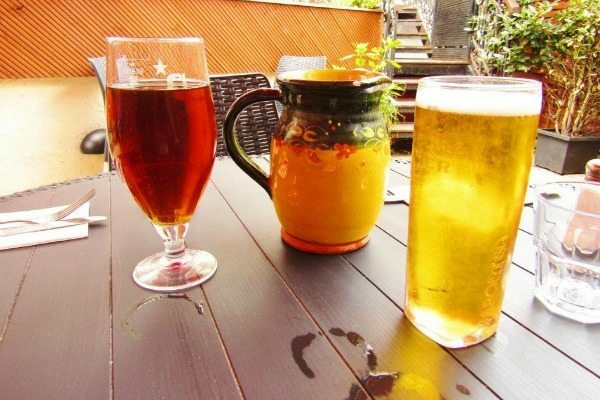 Spring had felt a long time coming this year so we were genuinely excited to be eating outside in shirtsleeves for the first time and decided to celebrate as any Brit would, with a pint! For me, a nice cold, tall, glistening glass of refreshing Becks and for Andrew, a pint of Doom Bar, an award-winning sweet, hoppy, malty, amber ale from the Sharp’s brewery in Rock, Cornwall. After sitting back in the very comfy chairs and enjoying our drinks for a spell we set about choosing our food. 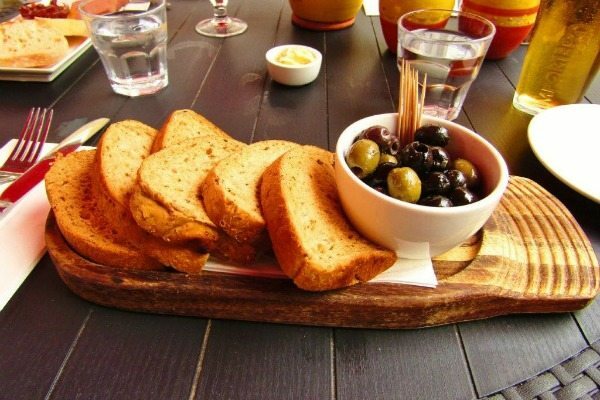 Inspired by the weather I came over all Mediterranean and ordered the olives and bread to start and Andrew went for the chicken liver pate and toast. I imagine the olives are really intended to be a “nibbles board for two” but I just really fancied it. I was served a bowl brimming with juicy mixed olives marinated in olive oil, garlic and herbs with several slices of soft malted wholegrain bread and butter. Needless to say, as much of an olive fiend as I am, I was unable to finish them all and Andrew was no use because he doesn’t like olives, what can I say, we all have our flaws. Anyway, I am kicking myself now that I was too British to accept a doggy bag when offered. 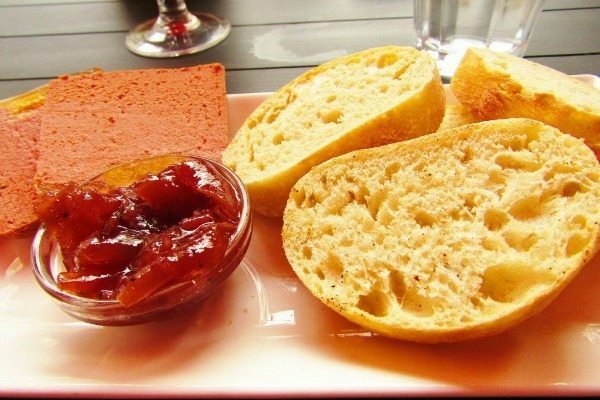 Andrew’s chicken liver pate was a lovely smooth consistency and very tasty. Rich, savoury and yet subtly sweet and very moreish. It was served with lovely, generously sliced, warm, toasted ciabatta and he also got a yummy little pot of sweet onion marmalade. 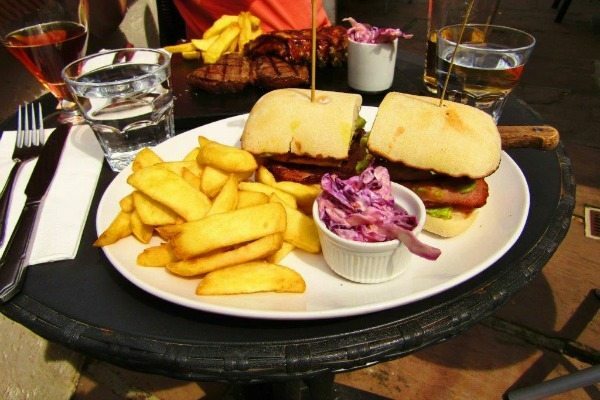 I chose my main from The Old Bank Lunch Menu, which runs from noon ‘til 4pm weekdays and includes burgers, hot and cold sandwiches, filled baked potatoes and a selection of regular Old Bank favourites. I went for a hot chicken, bacon and guacamole sandwich in a toasted ciabatta bun with a side of chips. It also came with a dinky little pot of creamy red cabbage slaw. The sandwich was generously filled with grilled chicken, crispy bacon, creamy guacamole, fresh lettuce, tomato and mayonnaise and was seasoned with plenty of freshly ground black pepper, exactly what I was hoping for. The chips were delicious too, golden and crisp on the outside and light and fluffy in the middle. Andrew selected a “Man Grill” from the Combo Grill Menu, where you can combine any steak with ribs or wings. 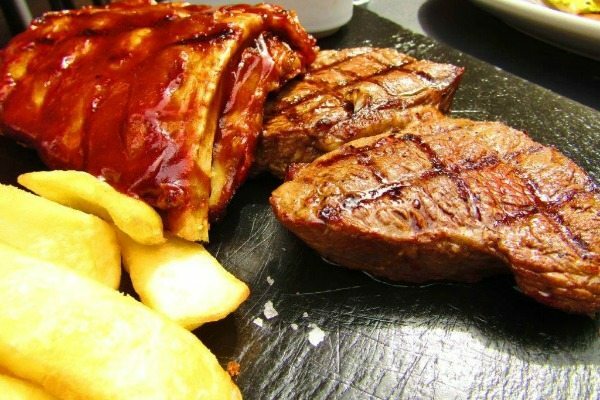 If you are feeling particularly peckish you can go for the “Super Macho Man Grill” otherwise known as the tri-combo, which includes a 7oz steak, half rack of ribs and a quarter of a roast chicken. In fact, if you ask nicely, you can basically have pretty much whatever combination your imagination can devise. 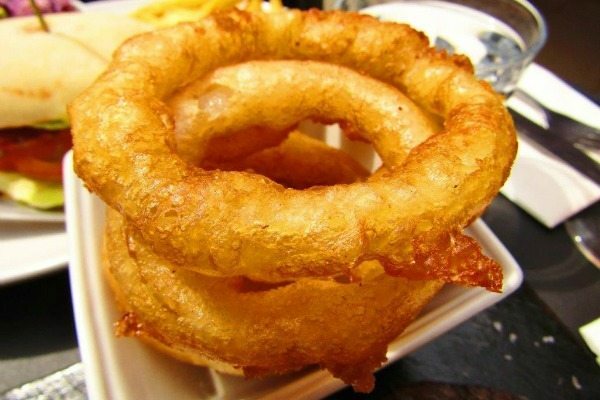 Andrew opted for a 7oz steak and a half rack of ribs with a portion of chips and a healthy stack of giant, golden, crispy onion rings. 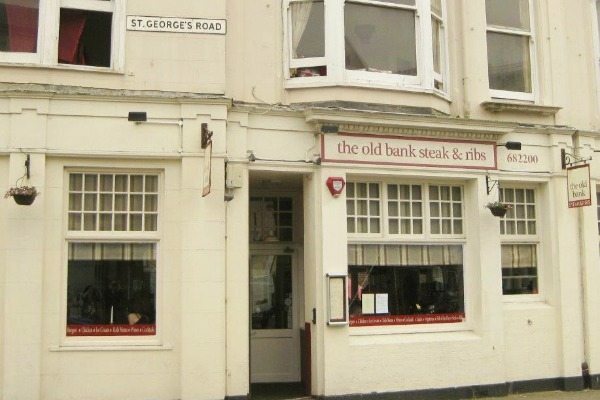 The chefs at The Old Bank use only the best British beef, which is hung for at least 28 days and then lovingly cooked over an open flame grill and you can tell. Melt in the mouth delicious! Andrew’s steak was melt in the mouth delicious! Cooked to a perfect medium-rare, impeccably seasoned and respectfully rested so that it was exquisitely succulent and impossible to eat without involuntary slack-jawed groans of heart-felt appreciation. 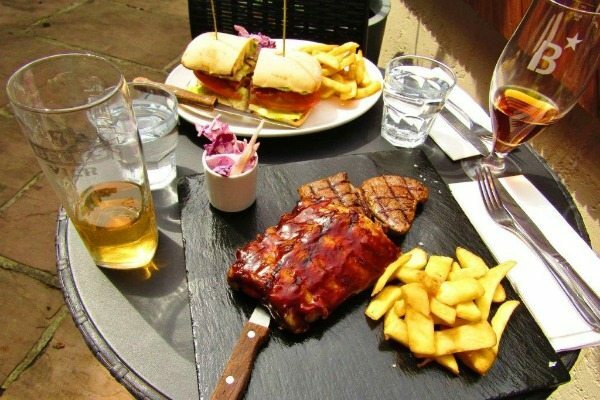 On the other side of the slate was a half rack of meaty, mouth-watering, beautifully tender ribs generously coated in the Old Bank’s delicious, signature sweet and sour barbecue sauce. We were offered dessert and would have laughed if we weren’t in some degree of physical pain from eating far more than is strictly necessary. “Thank you, no” we said politely and waddled happily off into the afternoon sunshine. At Old Bank there are a couple of vegetarian options for those herbivores forced to accompany their carnivorous friends. There is a children’s menu and they also do Sunday roasts with all the trimmings. You can get a great value “Early Bird” set menu on Saturdays 12-5pm and Monday-Friday 5-7pm. Check out their website for details of weekly promotions for more great value offers. You can also order food for delivery via Dinner2Go.